I'm a wee bit obsessed with this tee lately. I wanted to wear it in some outfit pictures, so I threw it together with this skirt and some new heels just for fun. I love this outfit! Are those Sinclairs from Warby Parker? I am on my second set of home try ons from there, I tried the Sinclairs but they didn't work for my face. I am 900% jealous that you can pull of frames in this style. 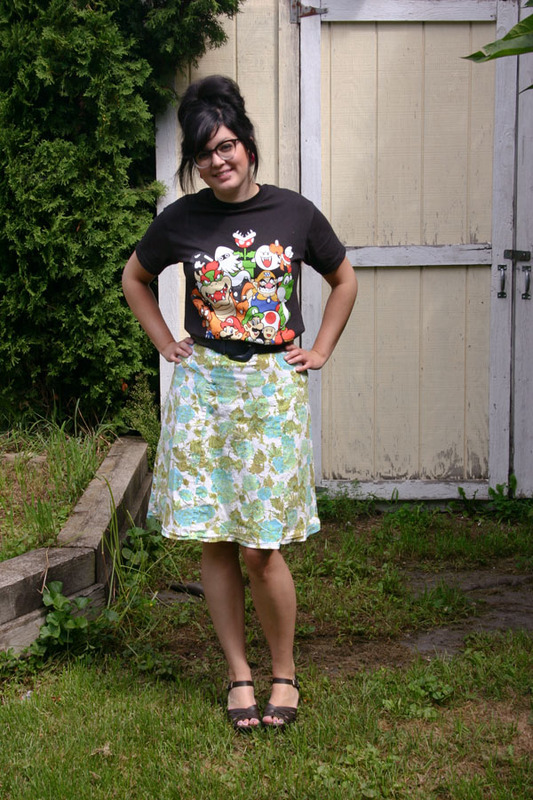 Finally, I think that the t-shirt/skirt combo is way underrated and therefore you're awesomesauce! @LoriLynn: Actually, I got them from Coastalcontacts.com! They have promotions where you can get a free pair of frames and lenses, so I only paid the cost of shipping! Love love love this outfit! 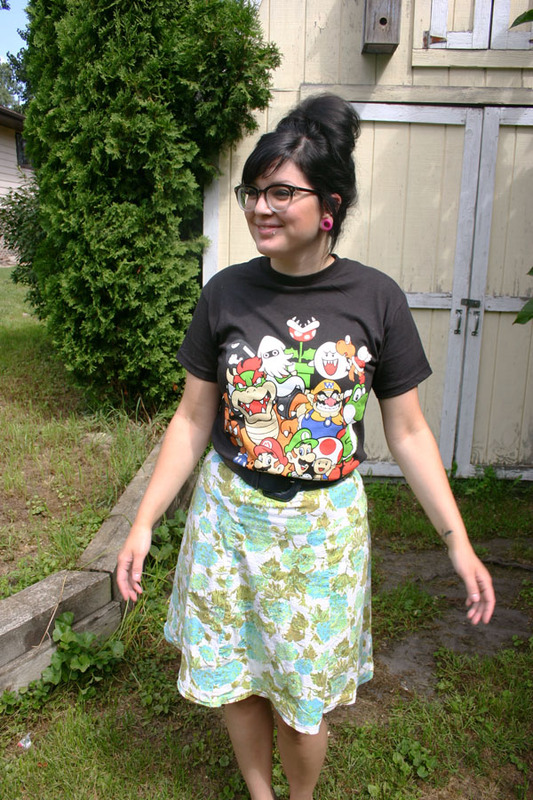 I've been trying to find a way to wear skirts more casual with a t-shirt but wasn't sure how it'd look. Oh and your hair is fantastic! I adore that tee so much. Canada needs to have Target set up shop sooner. I LOVE/need that shirt so much! i am obsesssssed with those frames! loooove this outfit - and i have a similar shirt!! also love how it's paired with that vintage skirt. so fun! I love the glasses! They look wonderful on you. I tried to go for the rounded look, but my face-chub was not having it. I love how effortlessly stylish you are. Okay, you changed my mind. I have a bunch of tee's that I've been trying to avoid wearing because I want to get away from the whole t-shirt thing. I have a bunch of skirts and dresses but its hard for me to find tops I like. Especially in the hot summer. You've conviced me to wear tee's with my skirts. I'm gonna do it. You look so cute, casual and girly. 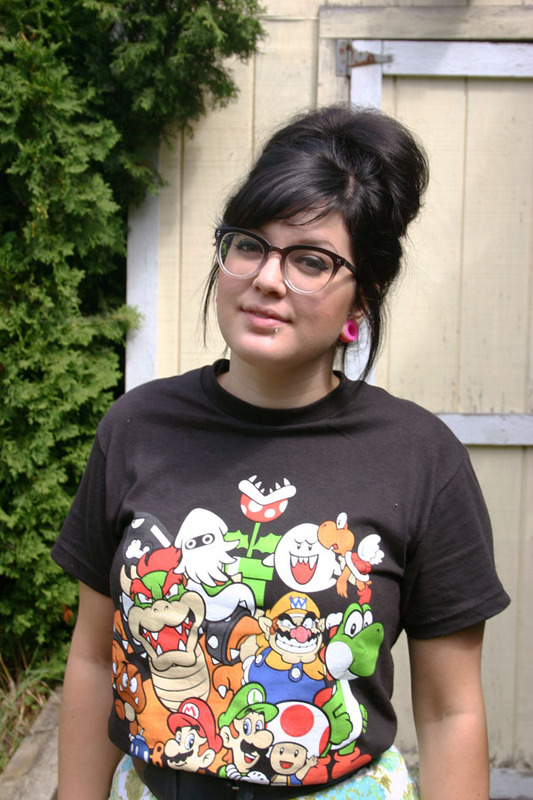 i love the mario shirt! so in love with your glasses! your hair is so cute like that!! that whole look is super hawt! i am investing in new glasses soon and those are just the kind i will be looking for!